In 2010 IKMemergent supported a substantial programme of activities in East Africa. These were in part a continuation of our research into the state of Local Content activities in the region, and in some other parts of sub-Saharan Africa, as described elsewhere on this site. We also brought this together with a continuation of the IKM interactive strand, which has been exploring the use and impact of digital technology on IKM. The roots of this IKMe activity are in the OKN and Local Content projects organised by OneWorld and IICD between 2002 and 2006. During 2008 and 2009 we connected with a range of organisations and individuals who define themselves as working with Local Content, many of whom had been involved in those early projects. For a number of reasons we chose to concentrate on sub-Saharan Africa, particularly East Africa. We recorded interviews on a blog (link) and brought a number to the 2009 KM4Dev workshop in Brussels (link). The picture which emerged was remarkably similar to that described in the 2002 Local Content report from Ballantyne et al (link). In summary, there is a lot of activity on the ground. Local Content is embedded into the everyday approach and philosophy of a wide range of individuals and organisations, with evident tangible benefits at local level. However, this local work doesn’t have a lot of visibility amongst the global development community. Yet, rhetorically at least, the issue remains a live one at local, national, regional and international levels. One major difference with 2002, however, is that there is little funding for Local Content activities per se, however much it figures in the missions and aims of organisations, notably larger funders. We didn’t come across any new funded programmes specifically aiming ‘catalyse the creation and exchange of Local Content’. This frustrating for many of those for whom this approach is at the core of how they approach development. They are keen to promote and extend their work, both singly and in collaboration. As well as the importance of continuing to promote the approach, and seek new funding, two other themes surfaced from the 2009 Brussels meetings. The first was the importance of ‘widening the ripples’. At the workshop several stories emerged of how specific knowledge travels over time and space, creating ripples of interest and narrative which spread both the knowledge of the item and the importance of the work involved in collecting and propagating both generalisable and locally situated knowledge as well as supporting community-centric cultures of learning and knowledge sharing. A second theme from the Brussels workshop, as important as in 2002, was the role and significance of digital technology and media to Local Content. IKMe Interactive Labs are exploring the intersection of knowledge, technology and media. The first was held in Dakar last year, information managers from Francophone Africa, organised by Olivier Sagne of CODESRIA and reported in the Giraffe by Hugo Besemer. It focused on the use of new opportunities provided by the Internet and Web2.0 as well as obstacles to publishing, promoting, aggregating and finding African research outputs. We have also reported here on the Digital Diving sessions that were organised in November 09 as part of Diplo Foundation’s Internet Governance programme at IGF 09 in Sharm el Sheikh. In Sharm we explored these issues from the perspective of different digital generations, This was followed, in May 2010 by the Metropolib workshop organised with the EADI Information Management Working Group in Delft. During 2010 we aimed to build on and integrate this stream of activity. We organized three preparatory events in Kenya to help prepare the AgKnowledge Fair and integrate IKM interactive: a planning retreat and two workshops. The July 2010 planning meeting, held at the ILRI research station near Machakos, Kenya, brought together James Nguo (ALIN), Roselinie Murota (SAFIRE), Charles Dhewa (Knowledge Transfer Africa), Peter Ballantyne (ILRI), Pier Pirani and Pete Cranston (Euforic Services). Alongside detailed conversations about agendas and processes we told stories, and reflected on what Local Content means to different people. We were all foreigners on the ranch and imported food, as well as expectations about meals, from our own backgrounds. As we prepared the meals we explored, through examples from Zimbabwe recounted by Roselinie, the meanings that attach to different foods, how they are served and to whom, learning again the cultural and locational specificity of Local Content. Food became one of the themes explored in different ways at the ShareFair. Led by Charles we also talked about markets for content, how commercial and non-commercial exchange co-exist: markets became another theme for the Fair. As we met the giraffes that run wild on the ranch, mingling with the cattle, we reflected on ways to record, tag and archive content so that it doesn’t disappear like the giraffe spoor along the sandy tracks. We invited information and communication specialists drawn from the regional local content project as well as locally-based individuals to either or both a social media and a local content workshop session. The major focus was on the agriculture/rural sectors, to link discussions with the Addis ShareFair. 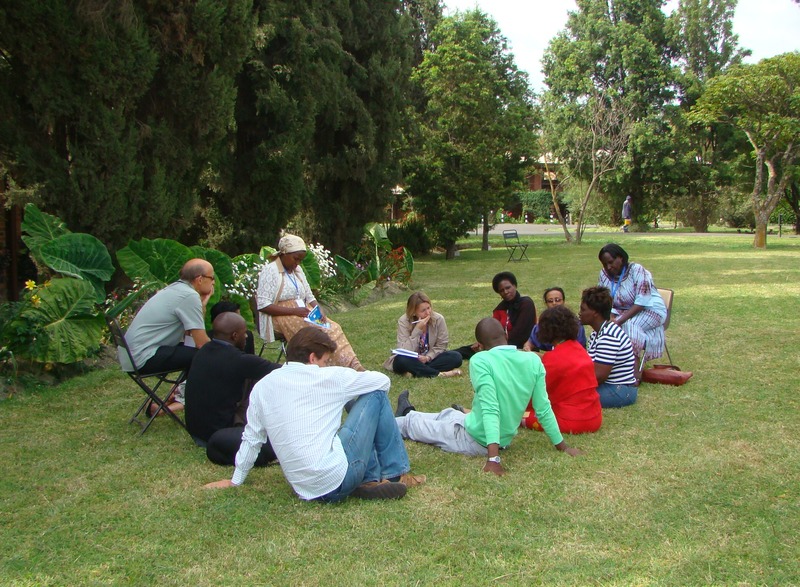 The workshops were organized at the ILRI campus in Nairobi and documented on the Euforic wiki. The 23 participants from agricultural research oriented organisations in Eastern and Southern Africa, as in the best of Social Media practice, built up on the workshop wiki reports from the activities as we went along, and on Flickr by Oliver Sagne. exchanging and documenting examples of how communities and intermediary NGOs create, capture and share Local Content. We also looked at tools which could reflect and extend the reach of the digital and online output of the participants organisations. We looked at aggregator tools like Netvibes, with which we had experimented in Sharm el Sheikh. We explored how we might use this, or something similar, as a way to present some of the richness and diversity in the work of the participating organisations. In that we are clearly leaving behind the model of data and content aggregation represented by the Open Knowledge Network (OKN )and others of its generation. The OKN software platform was built to support multiple sets of data, from different organisations. That architecture was an advance on the original imperial model of the World Bank’s Development Gateway which foresaw key development content being centralised into one database. However, OKN still required participant organisations to enter their content into the platform and follow prescribed data entry processes and formats. Web 2.0 has introduced tools which we can use to represent more equitably a plural online world. Netvibes and other similar tools take feeds from and link back to the online spaces of contributing organisations, only requiring them to publish and syndicate their content using open standards such as RSS. Local Content and Communication were at the heart of the event: “Africa’s rural areas and the people who live and work for them are packed with knowledge, information and data; and stimulating the creation, sharing, communication and targeted use of this knowledge is a vital driver for African agricultural development. As never before, innovators across the continent are drawing on a mix of traditional communication approaches, the power of new information and communication technologies like the Internet and mobile phones, and media like television and publishing to create and put knowledge to use in agriculture and rural development” . The AgKnowledge Africa ShareFair brought together over 300 innovators and leaders across the continent to share promising methods, tools and approaches that help stimulate and propagate Africa’s agricultural and rural development knowledge. It was held on 18-21 October, 2010 at the International Livestock Research Institute (ILRI) in Addis Ababa. Like the “Knowledge Share Fair” held at FAO in 2009 in Rome, Italy, the event was a ‘fair’ that showcased diverse knowledge and the multiple ways it is created, shared, communicated, and applied in development contexts. The event covered a wide range of knowledge types and modes of sharing — oral, visual, drama, music, video, radio, documentary, publishing, storytelling, web-based, geospatial, networked, mobile, computer-based, SMS, or journalistic – reflecting the knowledge, experience and wisdom of Africa’s farmers, producers, researchers, innovators and rural development workers. The “Share Fair” participants were a multi-stakeholder group, including farmers, extension workers, rural development agents, advocacy and development NGOs, international agencies, national and international research institutes, womens’ networks, academics, development projects, governments, private companies and the media. The heart of the fair was a series of thematic ‘learning pathways’ in a process of mapping, sharing and connecting people and activities. These pathways showcased how African ‘talents’ are creating, sharing and using rural knowledge – at the grassroots, in research and policy, and through intermediaries. The pathways focused on agriculture and climate change, land, livestock, and water. The Share Fair also comprised learning sessions, self-organized focus groups on specific issues and topics, such as mobiles, GIS, value chains, and radio. Of specific interest to IKMe these included sessions on Traducture, telecentres & Local Content and indigenous knowledge. 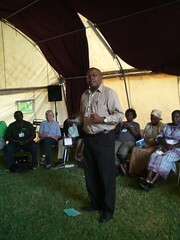 Finally, there was a special session on rural knowledge in Ethiopia, and an ideas and products marketplace. Mike Powell often describes IKM emergent as promoting slow knowledge, analogous to the Italian Slow Food movement, an approach to Knowledge centred on reflective, deliberative enquiry; marinating and melding multiple ingredients; and to be consumed respectfully, appreciative of the rich diversity of ingredients. In much of my own work, within and outside IKM emergent, I engage with the Knowledge equivalent of Fast Food: new technology mediated communication and knowledge sharing, blood-pressure raising snacks of Tweets, Blogs or Blips, where the consumption only encourages more consumption. Day 0 of the Fair was a Learning and Training day, the majority of which was given over to digital tools. But the organisers – including IKM emergent, since the programme is sponsoring 30 participants at the Fair – recognised the importance of providing space to discuss and exchange ideas on more traditional knowledge sharing approaches, in many ways more common and appropriate for the community level development activities on which the Local Content stream focuses. The facilitators were a mix of people who have been working with the Local Content project and vintage KM4Devers. We used Open Space as a way to allow the participant groups to choose from a menu of standard KS tools and suggest their own, which brought to the surface a rich mix of options: story telling, after action review, peer assist, fish bowl, testimonials, energisers, icebreakers (the <a href="http://www.kstoolkit.org">KStoolkit is a good aggregate resource</a> for these kind of techniques). For me, once we had facilitated the open space, it was an opportunity to sink into a more reflective space, a story telling session wonderfully facilitated by Roselinie Murota of SAFIRE (who’s been involved in several strands of IKM emergent). It was quintessential slow knowledge and, even without a fire and the smell of cooking, as part of the open space dynamic, more and more people were attracted to the group on the grass, telling stories about stories, arguing and learning, nodding and laughing. In the rest of the ILRI campus people were wrestling with Google, blinking at video-editors, sitting at computers learning how to use technology to be social. Here is Rose summarising what she took away from the sessions. And yet.... this is a blog, that was a blip: new media continues to sweep across the world. The challenge I take away from the story telling is to find ways to use the new technologies to tell stories, engage with slow knowledge. Tim Davies’ work storing and analysing the patterns of Tweets and Blogs from the Internet Governance is an interesting signpost. This very, formally too long a blog post, might be another. Try an experiment: follow #sfaddis on twitter, or on Delicious, and see if or how you can sense-make from the cascade of McK-snacks. There are two strands of activity relating to Local Content in the IKMe programme. This report is about the programme managed by Working Group two, organised by Peter Ballantyne and Pete Cranston. We have been largely concerned with people working in that part of the Local Content domain depicted on the right hand side of the diagram below. The diagram above is a representation of some of the different perspectives that are being explored throughout IKMe. The vertical axis relates to the impact on the participants of activities involving local content, suggesting that these range from personal or collective transformation at one end to simply becoming better informed at the other. The horizontal axis refers to the nature of the relationship between the participants and the Content, suggesting that, at a personal or collective level, it ranges from being intimately related to identity at one end to being simply useful in practical way to daily life at the other. This schema is intended simply as a mapping tool. The examples depicted on the diagram are intended as illustrations of polar type, as explained more fully in the table below. The diagram does not capture the complexity and dynamism of the examples. The arrows illustrate the important point that any particular set of activities and projects moves across the terrain over time, and indeed can be located in more than one position at the same time when seen from the perspectives of the different participants.